Hello my friends! I’m excited to announce that today marks the 1 year anniversary of Quick-Tip-Tuesdays on the SI Blog! WOW – time flies when you’re having fun! You may have noticed I didn’t include Q-T-T in the post title. I figure we all know what Tuesdays are about around here – so from now on I’ll just get right to it. 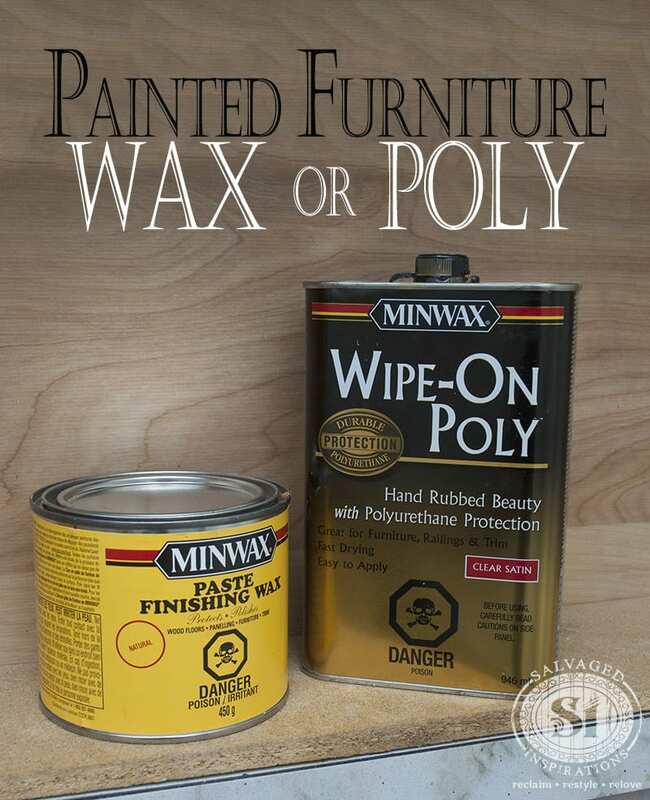 😉 One of the most common questions I get asked is “Should I wax or poly?”. The conversations sound something like this: I’ve painted a piece of furniture and it looks amazing… now what? How do I protect my restyled piece? What’s the most durable topcoat? Will wax hold up under heavy-duty use or extreme weather conditions? I JUST came across your blog like 2 days ago and it’s great. Thanks for all you do. I would love to paint this table and chairs, and I’ve been reading on your blog different ways to go about it. I have 3 small boys and there is no point in buying a nice table because they will destroy it. I have painted dressers with chalk paint before so I’m leaning towards spraying the table and chairs with that. But I feel like the wax will not give enough protection. This kitchen table will be spilled on, banged on, and sprayed and wiped with Lysol at least once a day. Is there a top coat that will give it the protection it needs from every single day big family use? Or is this wishful thinking? Any help is MUCH appreciated. This set would look amazing painted up!…very nice. For high traffic tables and chairs I like to use a non yellowing Polycrylic or Polyurethane topcoat. Many water-based brands are easy to work with and environmentally friendly. A few of my favorites are Varathane, Minwax and General Finishes. 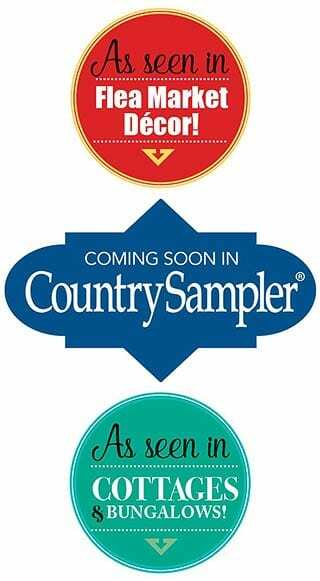 All of these brands come in flat, semi or gloss sheen. Have fun with your project and enjoy your week. Don’t let this email to Lisa give you the impression that I don’t use wax. I DO! And I use A LOT of IT – on MANY if not the majority of my chalk painted and milk painted pieces! 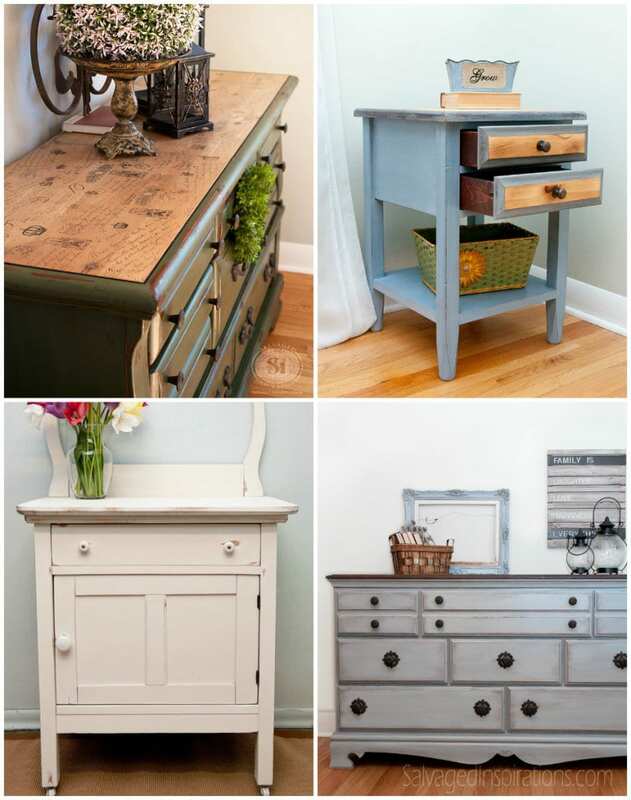 With the growing popularity of chalk and milk painted furniture, wax has become a SUPER POPULAR topcoat. Why? Because both chalk and milk painted furniture is porous in nature – wax easily absorbs into the surface. 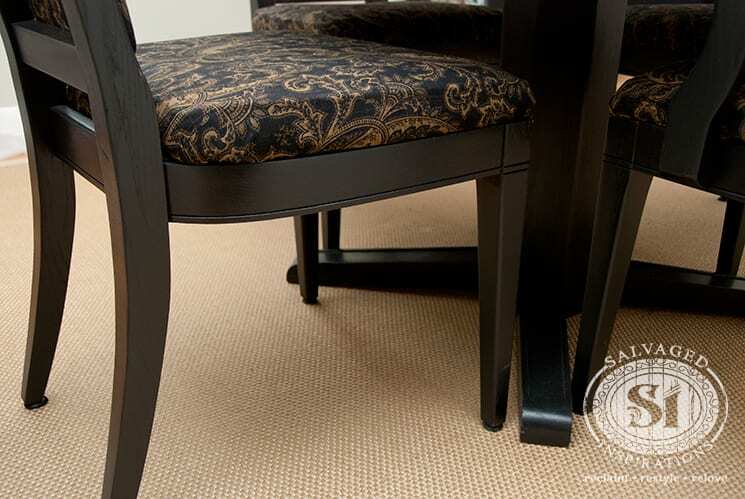 When the wax hardens, it seals the painted surface with a lovely natural looking soft sheen. The sheen can then be controlled by additional buffing. And some gorgeous effects can be created by using dark wax, white wax, or metallic wax finishes! Having said this, my preference for HIGH TRAFFIC items such as dining sets, children’s furniture or even kitchen/bathroom cabinets is POLY. I also prefer using poly products to seal latex/acrylic or enamel painted pieces because they are NOT porous is nature! The brands I use most often are Varathane Diamond Finish, Minwax Wipe-On Poly, and General Finishes High Performance Topcoat. These polycrylics and polyurethanes cure to a super hard finish and protect against grease, dirt, and stains. Also, a poly topcoat has a more forgiving cleaning process. Once fully cured, ‘regular’ cleaning products can be used unlike waxed surfaces. For waxed pieces, a slightly damp cloth is recommended for cleaning – and depending on use, reapplication of the wax may be required a few years down the road. 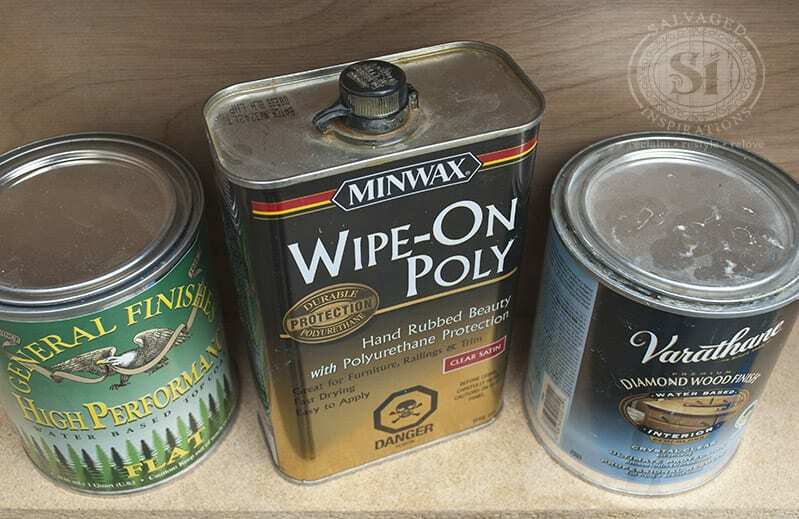 With all the different brands and various opinions on wax and poly, it can be confusing on which topcoat to use on painted furniture. To keep things simple, I use wax on chalk painted and milk painted pieces (unless they are high traffic items!) and poly products on everything else! If you have any questions feel free to leave a comment below! And please chime in with YOUR opinion(s) on using wax or poly? When you wax. When you poly. And why! As always, I love hearing from you and learn so much from your comments! I just stained a simple pine dresser and am looking for a pet and baby safe alternative to poly. Is there a safe, non toxic alternative. The piece is not in a heavy use area, so i dont think i need something as strong as poly. Im more concerned about the toxic chemicals and smells! Thanks so much! Hi Clara! I’ve been using this waterbased topcoat and it works amazing. Easy to use, no harsh smells or fumes, and once dry – super durable – waterproof – and easy to clean. Hope this helps. I made a huge mistake in waxing my dining table.top. How can i fix this to make the surface more durable? Just wipe it down with metho and do your polyurethane topcoat. Hi Amy! Are you sure it’s the wax that’s chipped? Wax often wears away but doesn’t usually chip….possibly this is a different topcoat – or maybe its the wood or veneer that is in need of repair. ??? It looks like the wax. Will it harm it to put a new pat of wax over it? That’s a loaded question Stacie because it all depends on the look and style you like. Chalk or Mineral paint are a lot of peoples go-to.. or a good enamel like Sherwin Williams All Surface Enamel is super durable. Spraying will give a more clean flawless look but you can also achieve a brush stroke free look while brushing on also. If you want some extra assurance on brush free look, there’s a product called Floetrol that you add to your paint. This extends the dry time and allows the paint to lay nicely. Hello! I am about to repaint my bedroom furniture. Some of the pieces (nightstand, vanity) do get pretty good use, and will have cups and things sitting on top. My question is, can I use a poly on the tops and wax on the drawers/legs? Or would you suggest using one medium for the whole piece? Thanks so much for your help!! Yes! I’ve used poly on top and wax on the body plenty of times! Works GREAT! I chalk painted a dresser for my daughters room and sealed it with wax, but I would like a poly top instead. Can I put the top coat right over the wax or do I need to sand it a bit? Hi Sajeev! Hmmm, not sure it’s ever been done before but I would recommend priming/sealing with a drywall primer before applying any type of paint. Hi, I just purchased a Thomas Hale dining table and chairs. The owner had the pamphlet which states the table top is lacquer finish. I have three little boys and don’t want a tablecloth. Is lacquer enough to keep the table from getting abused by spills, glue, paint, and whatever else? Or should I do some other finish, and can I put something right over top the lacquer? Hello there! So my wooden project is slightly out of the norm, its an Ashford Kiwi 2 spinning wheel. I do plan on staining and painting the main frame or it and painting the actual wheel itself since its made of MDF. I do plan on traveling with my wheel ane working with it outside when the weather is nice. What would be better tor it, Polyurethane or beeswax? The painted details will be in gold so I dont want to loose that glimmer but I don’t want the whole thing to be completly glossy either. I’ve started on my dining chairs with Annie Sloan chalk paint in graphite – followed by black wax to make it a true black. However, I don’t have 30 days to let wax cure!!! ( we need somewhere to sit LOL ) So, based on reading – you can add polycrylic over wax? Will it adhere to it? Thank you!! Denise, one more question……noted on mineral paint dresser project (which is lovely) you cleaned with TSP prior to starting. 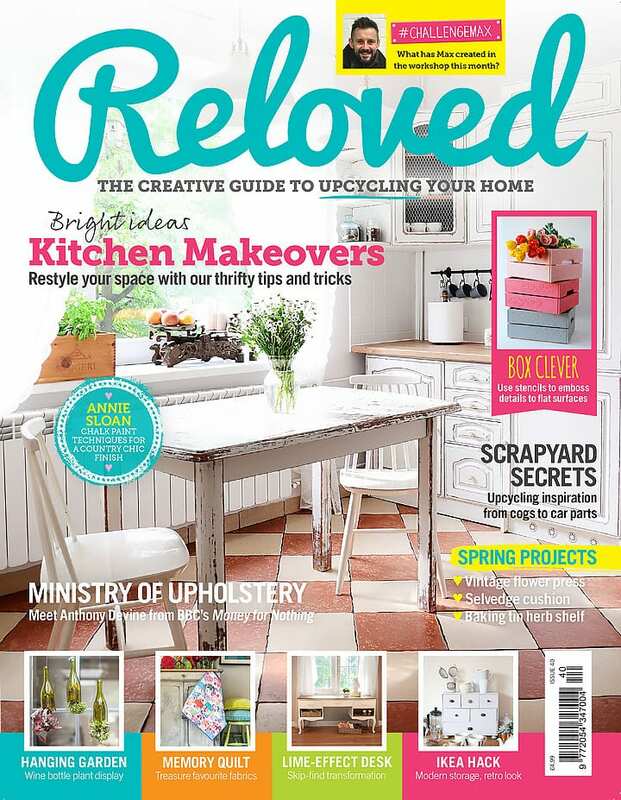 I thought from read up that TSP is not to be used before a chalk paint application – is this right or wrong as perhaps its use could ensure a better end result for my next project. (I had just wiped down and and sanded my bedroom suite.) Thx. again. There are some paints or primers that say right on the label “Do not use TSP” – B.I.N Shellac Primer being one example. So always reading the paint/primer label before you start is a great habit to get into. I’ve never heard/read TSP couldn’t be used before painting with Chalky Paints, and I’ve done it many times with no adverse effects. Buuuuut – here’s the thing. The TSP needs to be 100% ALL wiped off with a clean sponge or rag before painting! If any TSP is left on the furniture, the paint may not adhere properly. Just my 2¢, if your furniture isn’tdirty-grimy, I would opt for a milder cleaner. Hi love your site for all the tips and was hoping you could provide some insight on my project issue. Just completed an approx. 1930’s bedroom suite (wood laminate) with my own homemade chalk paint (using calcium carbonate) as wanted a specific colour. I sanded the unit thoroughly and used Kilz Max water based primer sealer per HDepot recommendation (primer required due to bleed thru) for first 2 pieces and then switched to Zinser BIN shellac based primer for other pieces as seemed to be a better product. I applied 2 coats of chalk paint and then topped with 3 coats of Minwax Polycrylic protector (sanding between coats) as per your recommendation for durability. (No distressing done/wanted.) Did accidentally nick just under the 30 day period but what surprised me is that when it did chip it took it off right down to the original piece finish. Trying to determine if this is just because of the short curing time or will I have a issue down the road? Just thought if it did chip the primer would stay attached. Am concerned as am now doing a fairly new pine wood (with semi-gloss to satin dark finish) coffee table set which will have heavier use and want to ensure no chipping. Intended to do same process using shellac primer for bottoms and natural wood stained on the tops, Can you provide any guidance as to my process/outcome? Am trying to be very thorough to ensure good end result. Donna did the chipping occur on. a piece primed with the Kiltz or a piece primed with the BIN? Hi Denise, I was really excited to come across your site and used your plaster of paris chalk paint recipe. However I have tried to seal it with furniture wax but it pulled off the chalk paint, and I also tried a clear lacquer spray over the top but it seemed to eat through the chalk paint. What would you recommend to put over homemade plaster of paris chalk paint to make it more durable without disturbing the chalk paint underneath? Hi Jo! Wax should not be pulling up all your hard work. It sounds like there’s an issue with the paint not adhering properly ie maybe a slick or shiny surface that would have benefited from a light sanding before painting. As for the clear lacquer spray eating through the chalk paint, I’ve never experienced that so you’ve stumped me. ??? If anyone reading this has an explanation and fix for this, please chime in! Hello Denise….. Have been following you for some time now and you inspire me to keep moving forward and have patience while perfecting my skills. 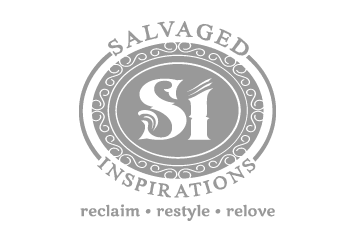 You relove your pieces to perfection! I’ve currently finished a china hutch in custom mix of Annie Sloan old white and pure shite. The style is a very lightly distressed farmhouse. I want to keep that flat finish.. Today I purchased General Finishes flat top coat. Have you used that on a light color and will GF yellow? Hi Ruth! I have used GF Flat on top of this cabinet and yes, it did slightly yellow. It really depends on what you do to prep your piece and what type of surface your painting. For instance, if your china hutch is a bleedthrough type of wood or has any type of staining and was not sealed with shellac and/or primer before painting, the topcoat very well might pull staining through even if you don’t see any peeping through your paint prior to top coating. On the other hand, if there is no bleed through or staining, it could be perfectly fine. It’s hit or miss. I’ve ‘missed’ one too many times and got fed up so now, when I work with white paint, I always seal before painting so I don’t run into any trouble. I hope this is helpful Ruth. Hi, I just painted my cabinets with a high gloss enamel paint (acrylic) by Behr. I love the way they came out! I want to protect them but am so scared to msss the glossy finish up and also scared of the possible yellowing. They were oak, and the paint is a shade of white. Do you have any suggestions? Hi Kim! I would suggest calling Home Depot (or wherever you bought the paint) and asking if it does require protecting. I use Sherwin Williams All Surface Enamel and often enamel paints don’t need a top coat – which may be the case with the Behr brand. My first experience with chalk paint, help! I am doing my daughter’s dining set. Put on a satin low gloss wax and think I need to apply a polyurethane also. Can I do that over the wax? Not recommended Sally. I wrote an entire post on it here. Hope it helps. Hi please help. I repainted my kitchen table and chairs with chalk paint it turned out awesome . For the kitchen table I put a water based polycrylic covering and it turned out great but for the chairs I did one cover of wax ,now when I sit on it I don’t like the feeling !! Am I able to put the polycrlic over that ? It is in the kitchen so I will have to clean them often. Am I stuck? Hi Adrienn! Your tiny island home in the middle of the mediterranean sounds heavenly. 🙂 Great project btw. I’m currently working on my bedroom furniture too; and waxing my bedroom furniture has been perfectly fine. (no kids here either) I would use 2-3 coats of wax and buff in between. I like to wait 24 hours in between coats. I am refinishing a church pew. I have sanded, painted it, distressed (via sanding), and then dark waxed it with Valspar Dark Satin Acrylic Satin Acrylic Antiquing Wax. I used a poly coat on top bc I wanted a bit more shine and better protection especially for a sitting area. The poly does not appear to have adhered well in all areas and looks “goopy” in others. I am new at this and am wondering if I need to completely start over or if I can somehow salvage what has been done? Thank you in advance! Hi there! Glad to have found your blog- lots of useful info! I chalk painted a breakfast nook set and waxed the table and freestanding bench. I haven’t finished the corner bench yet, but my question is: can I put a poly topcoat over my wax or do I have to first get the wax off my table and small bench first? If so, what can I use to get it off? Thanks! I am refinishing a china cabinet. I have sanded, painted it, re sanded for a antique look, and then dark waxed it with Valspar Dark Satin Acrylic Satin Acrylic Antiquing Wax. What top coat should I use to make it durable? I am new at this, do I need to remove the wax? Thank you!!!! I’ve used chalk paint in the past. This time I chose Annie Sloan in boot black for a high traffic piece. I have a quart of matte Minwax Polycrylic, but it always ends up showing brush strokes and has a semi gloss finish, which defeates the purpose of chalk paint!